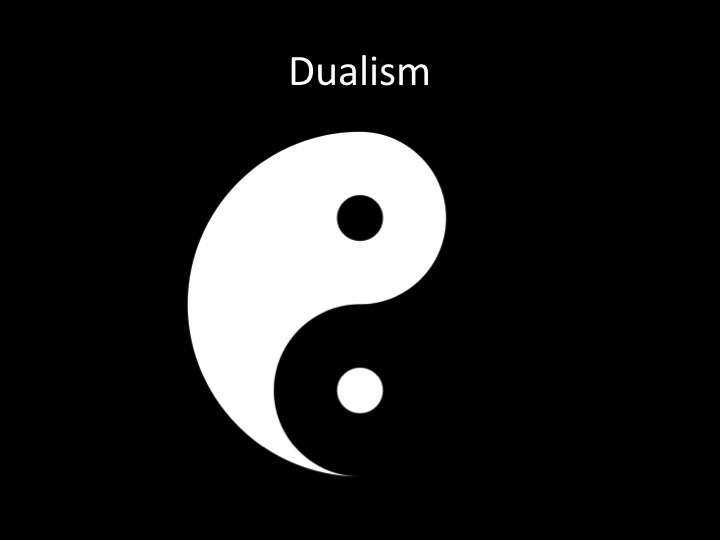 Dualism is the idea that there is an equal amount of good and evil in the world, and they compete with each other for dominance in the world. Another way to look at dualism is to say that there is a balancing of good and evil in the world and as evil rises up, good will rise to combat it. Sadly, if dualism were to be true, the converse of that rule would also have to be true. That would mean that if I were to help my neighbor mow the lawn, evil would need to rise up to balance out the good I’ve done. Dualism would suggest that to do good to your neighbor would be tantamount to an attack since evil must coincide with good. The assumption of dualism is that evil is as potent as good, and that good and evil are masters of their particular agents. Moreover, dualism assumes that good empowers God, and that evil empowers Satan. However, if a person were to look at the function of good and evil, it is far easier to see the truth that God is infinitely superior to Satan, and the nature of good and evil are each byproducts of God’s will and man’s sin respectively. Finding the “best” scripture to illustrate the failure of dualism proved impossible, so I’m just going to use a “good” one. I’d just like to point out, that observing the supremacy of God is easy if you are willing to open your eyes to the truth. 27 When Jesus had stepped out on land, there met him a man from the city who had demons. For a long time he had worn no clothes, and he had not lived in a house but among the tombs. 28 When he saw Jesus, he cried out and fell down before him and said with a loud voice, “What have you to do with me, Jesus, Son of the Most High God? I beg you, do not torment me.” 29 For he had commanded the unclean spirit to come out of the man. (For many a time it had seized him. He was kept under guard and bound with chains and shackles, but he would break the bonds and be driven by the demon into the desert.) 30 Jesus then asked him, “What is your name?” And he said, “Legion,” for many demons had entered him. 31 And they begged him not to command them to depart into the abyss. 32 Now a large herd of pigs was feeding there on the hillside, and they begged him to let them enter these. So he gave them permission. 33 Then the demons came out of the man and entered the pigs, and the herd rushed down the steep bank into the lake and drowned. The language used in this passage expresses the supremacy of Jesus in relation to the rest of the spiritual world. If the principals of dualism were to be accurate, then it would stand to reason that thousands of demons should be able to overpower Jesus, or at least pose a serious threat to his ministry. However, what is seen in this passage is that these demons were compelled to present themselves to the Son of God and beg for leniency. The demons seem to recognize the eventuality of their being condemned to “the Abyss” and acknowledge Jesus as the one who will send them there. It’s almost as though they knew Jesus was coming, and they were compelled to do what must be done when the God of Creation draws near. But how can that be? How is it that these demons who are condemned to hell, and are in constant opposition to God, are compelled to speak to and about Jesus in this most respectful way? Why did they not simply assault him? Why didn’t they torment Jesus? Why didn’t they even insult him from behind a rock or something? They were unable to approach Jesus without an extreme sense of humility, awe, and reverence. Just look at what they say. . 28 When he saw Jesus, he cried out and fell down before him and said with a loud voice, “What have you to do with me, Jesus, Son of the Most High God? I beg you, do not torment me.” The subject of their question is Jesus. The recognition of Jesus as the “Son of the Most High God” only adds to the argument that there is no battle, no struggle, and no fight between Jesus and these demons. Jesus is in complete command of every element of this spiritual encounter. A richer appreciation of this story can be had if you go back and read the events leading up to it. Luke 8:22-25 records when Jesus calms the storm. The winds and waves raged to the point that experienced fishermen feared for their lives. It may have been that these guys thought that evil was about to overpower them, but in this moment Jesus rebuked wind and waves and peace came upon the water. Jesus expressed his supremacy of nature, even the natural events that put people like you and me in danger. Then when morning comes, he exposes his deity even further by engaging a set of demons who are almost paralyzed with fear. The supremacy of Jesus is startling, and the idea of dualism washes away when we take these stories into account. It is important to begin by explaining my purpose and position in regards to Satan’s attack. I hope that the reader begins to view Satan appropriately, and to wage spiritual warfare for our neighbor, rather than against Satan. The sole purpose of this, as well as all of my other posts is to advance the gospel message for people who are still lost in darkness. It is also important for me to note, that I am not projecting myself as being one who has overcome Satan or his schemes, only that the One who has overcome resides within me. Satan is a part of creation and as such, he is bound in many ways by time, space, limited understanding, and an eternal fate. Realizing these limitations can help us begin to grasp the power that Satan does not have. Furthermore, realizing that Satan is being limited can give us a greater sense of peace when it comes to our interaction with his lies. As an example, I have a son who is 2 years old. The fact is he would eat just about every piece of candy known to man if I let him, but that wouldn’t be good for him. When he plays in the living room/kitchen, he will often go to the counter where we keep the candy and point to it and ask for some. At times he will even beg us for candy, but if it isn’t time to have candy, and if his parents don’t want him to have any, there isn’t really anything that he can do about it at this point in his life. He is limited. -He is limited by his height so he can’t reach the candy. -He is limited by his knowledge of physics so he can’t catapult some object and dislodge the candy from its resting state. -He is limited in his acrobatic prowess so he cannot catapult himself to the height of the candy. -But ultimately, he is limited by his parents. We are the ones that decided to put the candy where he could not reach it. Limitation is an active process. I have to be aware of the advancements that Rutledge makes as he grows and must make sure that he can’t reach certain things. Sometimes, that’s harder than others, but the active placement of candy on a shelf is an assertion of his being limited by our judgment. God’s active limitation of Satan, aside from the time/space limitation applied to all created beings, is best illustrated in the story of Job. Satan is depicted in this section of scripture as being limited in every possible way by God. He is only able to do what God specifically allows. It’s not that Satan was given some parameters in which to abide and then had to chose whether or not he was going to obey, it is as though God set a clear and discernable constraint to Satan’s activities. Satan was allowed to go only so far before the boundary was reached, and when he arrived at the end of his rope, he was unable to continue. Throughout the text, the authority of God is never in question! I have been given authority to act on behalf of this God, and to intercede in ways that reflect His great mercy and grace. I have been given a royal position of adopted son in the kingdom of God and am therefore at war under His banner. I have no authority of my own, but am empowered by the almighty God to wage war on His behalf. So when Satan flings his arrows at me, my faith in the one who sent me extinguishes them and shields me from harm. My faith does not rest in what I can do; it is a result of what God has already done!